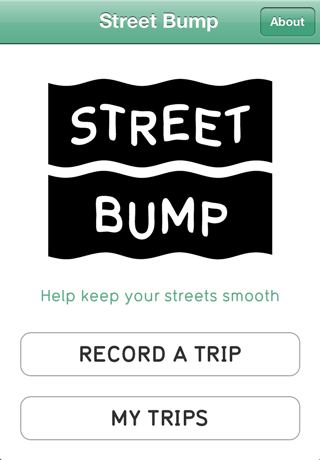 A project of Boston's Mayor's Office of New Urban Mechanics, Street Bump helps residents improve their neighborhood streets. Volunteers use the Street Bump mobile app to collect road condition data while they drive. Boston aggregates the data across users to provide the city with real-time information to fix short-term problems and plan long-term investments. In partnership with New Urban Mechanics, Connected Bits designed and developed the app, collaborating with IDEO and building upon research by Professor Fabio Carrera. 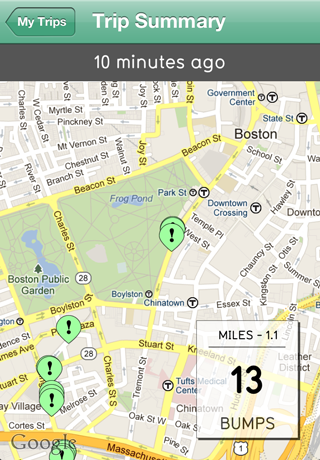 The City of Boston will make the app freely available so others can use and build on the project's efforts. How do I get Street Bump? Download the app for free at the App Store. How do I use Street Bump? 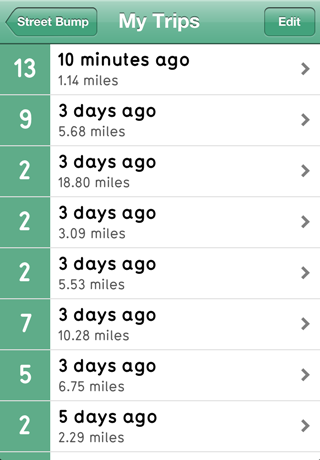 Simply open the app and hit the “Record a Trip” button. When your trip has concluded, hit the “End Trip and Upload” button to submit the trip to Boston or the “Cancel” button to delete the trip. Where should I put my phone when I am running the app? We recommend placing the phone in a stable location such as a phone mount, which will minimize the phone jostling and sliding. Each vehicle, however, will be different. You can experiment with different locations such as on the passenger seat or in a cup holder to determine the phone position that most accurately records roadway problems. Can I run Street Bump in the background or use other apps? No. Unfortunately, we cannot collect accelerometer data unless Street Bump is in the foreground. 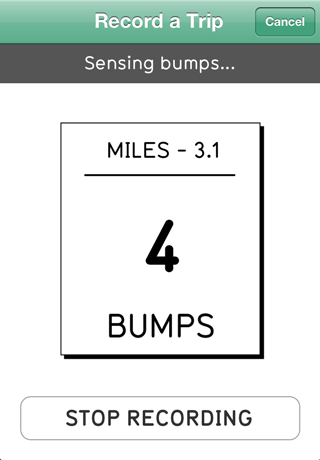 If you switch out of the app to take a phone call or check Google Maps, we recommend you simply end your current trip and start another trip when you return to Street Bump. How does Street Bump Work? Street Bump utilizes two of the phone’s sensors, its accelerometer and GPS. The sensors detect “bumps” that the City maps. How does Boston use the data? Our approach hinges on the ability to analyze large amounts of data. If three or more bumps occur at the same location, the city will inspect the obstacle and assign it to a queue for short-term repair or record its location to assist with long-term repair planning. I accidently recorded a bump. How can I tell Boston it wasn’t real? Don’t worry about it! On the individual level, there are a number of variables such as GPS accuracy or differences in car suspensions that affect when and where a bump is recorded. Our initial research demonstrates that with large volumes of crowdsourced data, road defects stand out. We won’t inspect a roadway problem unless we get multiple reports. I hit a pothole but the app didn’t record a bump. Why did that happen? A number of factors determine when an individual bump is recorded including your phone’s placement in the car and the speed of your vehicle. If you want to make sure the City responds to a particular problem as quickly as possible, submit a pothole request through the Citizens Connect mobile phone app or call the Mayor’s Hotline at 617-635-4500. If your phone consistently fails to record potholes and other roadway obstacles try adjusting its positioning in the car. For example, you will find that the phone records more obstacles when it is placed horizontally than vertically.